Venezia Santa Lucia Railway Station is a popular gateway to Venice's historic center. It's a terminus station served by long-distance trains and by commuter trains from Mestre and other locations on the Venetian mainland. 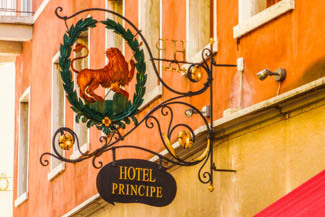 Finally, any hotel near the Piazzale Roma is also easy to reach from the railroad station if you don't mind crossing a bridge or two. For recommendations with walking directions and maps, see our Hotels near the Piazzale Roma page.